I’ve been eying on Samsung Galaxy S II since its launch in Malaysia in June 2011. It’s the superior hardware in Samsung Galaxy S II that attracts me compared to my Samsung Galaxy S which I’ve been using since end of last year. Besides, I’ve heard many good feedback from the current owners of Samsung Galaxy S II too. If you are already a Samsung Galaxy S II user and is proud of the phone, here’s a site http://bit.ly/pa8JrF for you to express how in love you are with Samsung Galaxy S II. 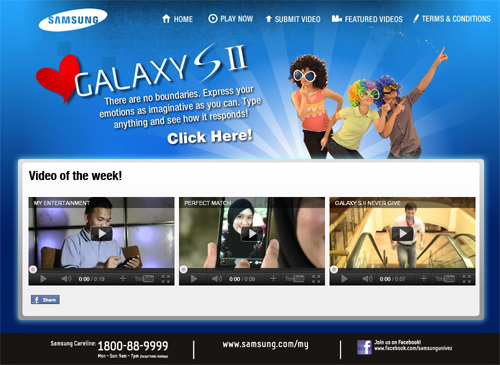 It a microsite developed by Samsung dedicated to Samsung Galaxy S II owners to submit short videos showing their love for the phone. i couldnt love them more with their new S2 release. and i heard they will be updating s3 on the mid 2012. i cant wait! article with us. I like this post. Keep sharing with us in future too. Samsung Galaxy SII is a great mobile phone!!! !